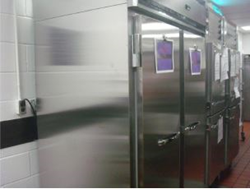 The hospital recently dedicated a refrigerator/freezer strictly for kosher foods. Calvary Hospital recently added a brand new refrigerator/freezer at their Bronx campus, dedicated to storing glatt kosher meals and cholov Yisroel dairy products for Jewish patients. Support from several foundations including the David Berg Foundation made it possible for Calvary to purchase the unit. "Our goal is to provide tasty well-balanced meals for all our patients," said Donna DeEsso, MS, RD, CDN, Director, Nutritional Services, Calvary Hospital. "Having this dedicated unit at our largest inpatient location will make it possible to maintain kosher conditions that our observant patients and families require and appreciate." "The newly expanded amenities to help provide kosher food for patients strengthens our commitment to making the Calvary experience as accommodating as possible for our patients and families," remarked Rabbi Rachmiel Rothberger, BCC, Jewish Community Liaison. Each year, Calvary cares for more than 800 Jewish patients and families at their Bronx and Brooklyn campuses, The Dawn Greene Hospice at Mary Manning Walsh Home (Manhattan), Ozanam Hall of Queens Nursing Home, and in hundreds of homes throughout the greater New York area. Kabbalat Shabbat services each week and celebrations of all major holidays. Calvary is part of the Pelham Parkway eruv and within walking distance to nearby minyanim affiliated with the Albert Einstein College of Medicine. Calvary’s Bronx campus houses a sacred 135-year old Torah scroll (No. 515; circa 1880) on permanent loan from the Memorial Scrolls Trust in London. In November 2016, Calvary completed a restoration of this Sefer Torah and made it possible for it to be used in worship services again. Calvary's scroll is one of only 20 in the greater New York area today and one of just a handful that has gone to non-Jewish recipients.